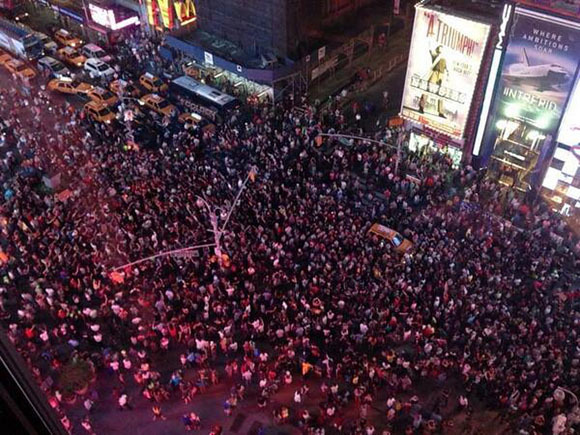 An overhead view of the NYC march. Photo by Anthony J. Hayes. MARLENE DUPERLEY: I have a son. It’s difficult because he sees it, and he’s already had dreams about it. And he’s already had dreams about the man following Trayvon. He woke up and told me, “Mom, I saw him following Trayvon.” So, I mean, he has nightmares already. So that’s just a part of what we have to go through every single day. And I don’t think this country realizes what we go through as a Black people and how we feel every day. And having our kids go out, we don’t know if they’re going to come home. And it saddens me. My heart is broken. MARCUS WATSON: This is something that could happen to anyone’s sons, whether you’re Black, whether you’re Latino, whether you’re Asian. Anyone can be taken. It’s about someone else saying that their lives mean more than yours. INDIA: I had a feeling in my stomach, in my gut, and it felt like—I don’t know. It felt like it was my son. I cried. My name is India, and I’m with my daughter Kennedy, and it’s important, because I’m trying to show my daughter what—where we live and the country we live in. I don’t want her to think that all people are bad, but I have to let her know that there are some people out there who see Black people, brown people, people who are different from them, as less than they are, and it’s not right. So I try to explain to her—this is like the perfect example. We watched the trial. We watched it every day. It was like homework. After camp, we sat down, and we watched it. And each individual day, we talked about it, and I discussed it with her. MARLENE DUPERLEY: And I’m here for Trayvon Martin, for all the young Black men and for everybody, for all of the people. It’s not even just about being Black. It’s for everybody. DANETTE CHAVIS: We still today want justice! And we will not be satisfied until justice is obtained! It should be noted that Black young men are disproportionally singled out for suspicion more than any other people. More demonstrations are planned for the July 20-21 weekend. All Black, civil liberties and civil rights organizations have denounced the verdict. On February 26, in the city of Stanford, Florida, in the Deep South, Trayvon Martin, a 17-year-old Black man, was walking home from a store where he bought some tea and a snack. He had no weapon of any sort, not even a penknife. Trayvon was not engaged in any unlawful activity or any activity other than walking and talking to his girlfriend on his cell. George Zimmerman, a self-styled vigilante, saw Martin, and decided he looked “suspicious.” What he saw was an African American teenage male wearing a “hoody.” That was enough for Zimmerman, who called into his police buddies at the local station and reported his suspicions. If it was a white youth in a hoody that Zimmerman saw, he would have paid no attention. To “driving while Black” and being pulled over or worse, must now be added “walking while Black and young,” which might get you murdered. Zimmerman had a history of calling into the station to report “suspicious” people. It turns out they were all Black men. Even the police dispatcher told Zimmerman to stay in his car and not to follow Trayvon, an instruction Zimmerman ignored. He got out and proceeded to stalk Martin, and started running at him. His puffing could be heard on the police tapes. Martin began to notice he was being followed, and told his girlfriend over the phone that he was becoming concerned. She heard him being attacked, and his phone went dead. There was an altercation, during which Zimmerman pulled his gun and shot Trayvon, killing him. When the police arrived a few minutes later, Zimmerman told them he killed Martin in self-defense. Zimmerman did have some minor cuts and bruises, and the police questioned him. They believed Zimmerman’s version, and under Florida’s “Stand Your Ground” law decided to release him without any charges. There was an outcry in Black communities across the country, with large marches and other forms of protest. In face of this uproar, finally after a month and a half charges were brought against Zimmerman by a special prosecutor who had to be brought in because of the police recalcitrance. The trial itself was a farce. A jury was chosen that did not have a single African American on it. The jurors were not identified, ostensibly for their “protection” from you know whom if they acquitted. The jury was composed, we are told, of five white women and one Latina. One of the jurors said before the trial that the earlier demonstrations demanding charges be brought were “riots,” and she was not disqualified. Although this was an open-and-shut case of racial profiling, those words were never spoken by the prosecution. Police who testified for the prosecution somehow always got around to praising Zimmerman. 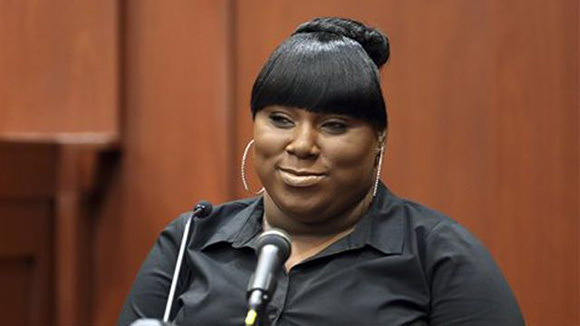 The prosecution allowed the case to revolve around exactly what happened in the altercation between Zimmerman and Martin. It was Zimmerman’s version, of course, that the jury heard, not Martin’s, since he was dead. The only witness who gave a partial version of what Martin saw was his girlfriend, who recounted the phone conversation with him. This young black woman is from Haiti, and had a Santo Domingo father, so her first languages were Haitian Creole (based on French) and Spanish. English was her third language. The prosecution and judge stood by and allowed the defense attorney to browbeat and humiliate her on cross-examination – I had to turn off the TV coverage at that point, it was so disgusting. In any case, however vigorously Martin fought back against his attacker, the fact is that the 17-year-old didn’t have a gun or knife or club or stick. Zimmerman had a gun, and had enough room between himself and Martin to pull it out and kill him with one shot. That is not self-defense! That’s murder. The case was compounded by Florida’s “Stand Your Ground” law, which expanded the “self-defense” justification. Before that law, “self-defense” could not be claimed unless there was no way to flee the situation. In Zimmerman’s case, he had plenty of opportunity to leave the scene. But even granting the “Stand Your Ground” law, it was Trayvon Martin who attempted to ward off his attacker, not the other way around. Zimmerman didn’t “Stand His Ground,” he ran after Martin and shot and killed him. If anyone had the right to “stand his ground” it was Travon, who had only his hands to fight back with against his armed assailant. Just a couple of weeks before the Zimmerman verdict, the U.S. Supreme Court overturned the historic Voting Rights Act of 1965 on the grounds that racism is no longer a big deal in the U.S.
Tell that to Trayvon Martin’s family.